Saint John Mayor Don Darling says he plans to have "focused discussions" with industry officials after an explosion and fire at the Irving Oil refinery Monday shook homes and sent at least four contractors and another unidentified person to hospital with non-life-threatening injuries. Saint John Mayor Don Darling says he plans to have "focused discussions" with industry officials and review communications plans after an explosion and fire at the Irving Oil refinery Monday shook homes and sent at least four contractors to hospital with non-life-threatening injuries. Meanwhile, New Brunswick's Horizon Health Network said they treated at least five people with non-life-threatening injuries following Monday's explosion. "It cannot be our norm here that we're having fires and explosions," said Darling, referring to a string of industrial incidents in the city in the past year. "These are accidents, but this cannot be the new norm for people living in Saint John." 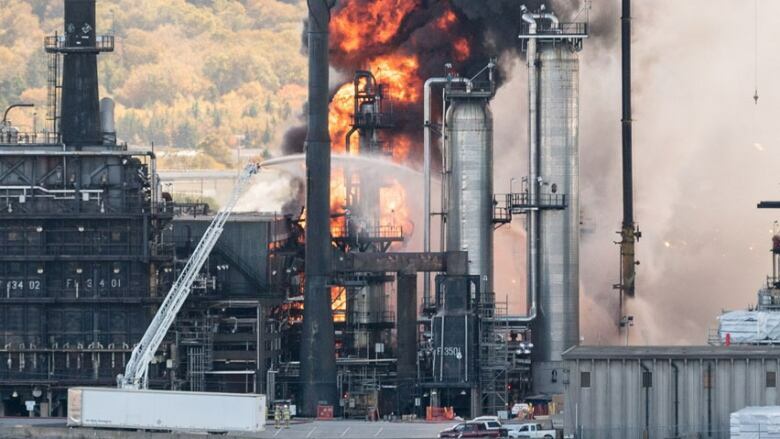 The Saint John Emergency Measures Organization (EMO) said "the last" flare-up at the refinery occurred around 9 p.m. AT — about 11 hours after the initial blast that saw flames shooting an estimated 30 metres high and a plume of black smoke billowing over the city's east side for hours. Officials have not said how many other flare-ups occurred, but did say it's "part of the normal stabilization process" and that crews were on site to monitor the situation. Although EMO has now deactivated, the Saint John Fire Department still has one fire crew and command staff at the scene to assist with the recovery efforts. Irving Oil said Tuesday morning "the refinery as a whole is safe and the specific site of the incident is isolated and contained." "Through our continuous air monitoring, we have determined that there are no concerns with regards to air quality. Accordingly, we are currently planning to have our turnaround team back on site this evening for the night shift," the company said on Twitter. "Our plans for returning to full turnaround mode will be discussed at that time. We regret that this incident has happened and are sorry for the impact that it has had on so many in our community." Irving Oil and EMO officials said Monday that four contractors were treated at the Saint John Regional Hospital for minor injuries, but the Horizon Health Network reiterated Tuesday it had treated five individuals with non-life-threatening injuries following the blast. It's unclear if the fifth individual was an employee, contractor, resident or a first responder. "We are declining to provide further details due to patient confidentiality," Horizon spokesperson Emely Poitras said in an email. Irving Oil officials are still trying to determine the exact cause of the explosion, but believe it stemmed from a malfunction in a diesel-treating unit, which removes sulphur from diesel. Although the explosion occurred on the Thanksgiving holiday, close to 3,000 people were working onsite due to a regularly scheduled maintenance project. About 100 were the normal operations crew, while the rest were tradespeople working on the turnaround project, officials said. "As a mayor, when you're reading about an explosion in Canada's largest oil refinery in the middle of your city, your heart starts pumping," said Darling. The incident comes on the heels of a "significant" explosion last month at the American Iron & Metal Company Inc. scrap-metal recycling plant on the city's waterfront, an apology from Irving Oil in June for the release of a mystery product from the refinery, and a butane leak at Irving Oil's Saint John East Terminal in January that forced 65 people from their homes for days. In a Facebook video post, Darling said Monday was "a bit of a scary day for everyone" and he has heard from "many" concerned residents. "And I'll assure you that we will have those next phase conversations at the right time," he said. "The days, weeks and months ahead, will give us the time to have focused discussions and look for a new relationship going forward," Darling posted on Twitter. Darling applauded the first responders and emergency officials who responded to the "major event in our city," but he said a communication review is necessary. It was an hour before any official information came through on social media to let the public know how first responders were handling the situation. "We live in a world of instantaneous communication," Darling said in an interview with Information Morning Saint John. "I doubt we'll ever be able to meet that." Darling said there was a lot of speculation travelling through social media that scared a lot of people. In the meantime, he said, emergency responders were tackling the "live event" and trying to understand what was going on, what could happen and what the response would be. "I understand people were anxious and they were sitting back, watching this happen, so my commitment is, we will review communications as well." 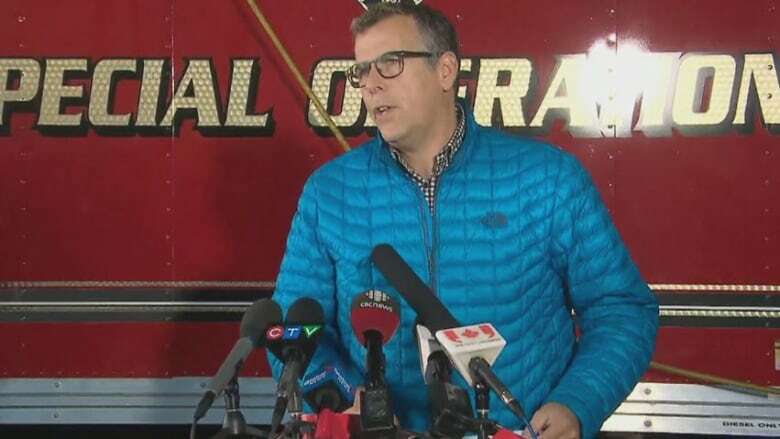 Kevin Clifford, fire chief of the Saint John Fire Department and director of the Saint John EMO, said he realizes it's vitally important the community knows public safety officials are involved in an emergency situation and they should have gotten information out to the public sooner. "That's on me, I was on the ground," he said. "We'll work on being better at that notice going forward." 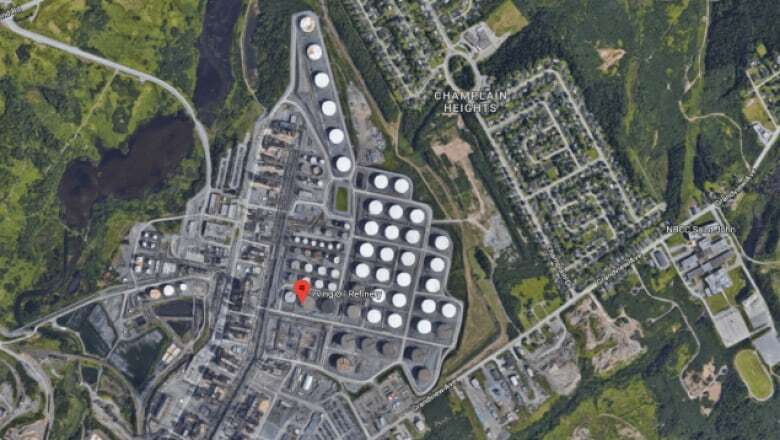 The refinery, which is less than five kilometres from the city centre and surrounded by residential neighbourhoods, was evacuated and shut down following the 10:16 a.m. AT explosion. No evacuation order was issued for area residents, but Saint John Emergency Measures Organization (EMO) officials encouraged people to stay in their homes up until about 6 p.m., when the situation was deemed stabilized. An evacuation order wasn't required, EMO manager Mike Carr told reporters during a news conference Monday afternoon. "We work under the direction of the boots on the ground … We go by the people that are onsite that can make that situational assessment and at no point in time did they think that we should actually evacuate the area," he said. "It seemed to be contained to that [diesel-treating] unit for the duration." When Clifford arrived on scene, he said the situation was bad but it wasn't getting worse or expanding to units beside where the explosion happened. "At that time, evacuation was something we had as a possibility, not something we needed to exercise," he said. Darling said he stands by that decision. "Had there been the need for Chief Clifford, the head of our EMO with 40 years of experience, would have made that call with his team," he said, referring to evacuation fire head Kevin Clifford. Air quality monitoring is ongoing. As of late Monday night, no concerns to public health had been identified, officials said. The mayor commended emergency officials for doing a "stellar job" and said he's grateful no one was killed or seriously injured. "Today was a big test and I'm thankful everyone goes home tonight," he tweeted. It's unclear how long the refinery will remain shut down. Irving Oil is working with WorkSafeNB, the Department of Environment and EMO officials to "understand what happened" and decide on next steps, said chief refining and supply officer Kevin Scott. The company is also offering counselling to any employees or contractors shaken by the incident.